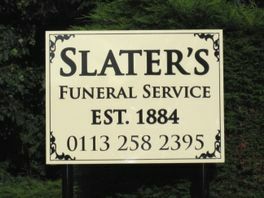 Slater's of Horsforth can arrange pre-paid funeral plans with families through Golden Charter. A funeral plan can make good financial sense and, in consideration of others, will give peace of mind. You can choose your funeral arrangements, for your own piece of mind. You can save your family from having to make difficult decisions trying to guess what you would have wanted, at such a distressing time and plan your funeral in advance. There is no age limit and no awkward health questionnaires. You can make a once only payment in full or choose instalments. Complies with the Funeral Planning Authority Code Of Practice and Financial Services and Markets Act 2000.